If you travel in activist circles (or you read the EF! Newswire), you’ve likely heard of TWAC—the Trans and Womyns’ Action Camp—by now. And if you’re a person who lives life identifying with the male gender that you were assigned and socialized with since birth, hearing about it is as close as you’ll get. You don’t have to be at these camps and actions to recognize their value to the broader movement that they are a part of and to show support. Is there a TWAC camp or action in your area? Can you kick-in on their fundraising efforts? Spread the word to your female and trans friends and family? Are they asking cis-men for any help with childcare needs, or behind-the-scenes legal support work? And perhaps most importantly, can you step back and show respect when someone makes it clear that your help is not needed or your presence is not desired? 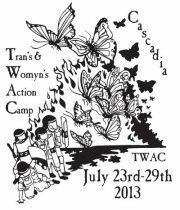 TWAC Cascadia will be holding an ecodefense action camp this summer in Western Oregon, within 90 miles of Eugene. Come join us in the forest from July 23rd-29th for a week of discussion, skillshares, networking, workshops, story telling, and action! This action camp is planned by and for folks who identify as women, transgender, transsexual, gender queer, and gender variant. There may be opportunities for cis-male allies to participate in support roles closer to July. We are dedicated to creating a space that is as accessible and inclusive as possible within the constraints of a backwoods setting. We are planning to set up child care, and may be offering travel stipends to both workshop presenters and participants from traditionally under-represented groups depending on funds. What is TWAC? TWAC is a movement to unite, support and inspire trans and womyn activists to take action against patriarchy, oppression and exploitation in defense of our communities and ecosystems. We will start the search for fierce workshop presenters very soon. We will be looking for presenters especially on the topics of anti-racism, environmental justice, and trans liberation.